← VIP Round table Discussion: How Can the EU and China Work Together on Climate Action? China Association of Plant Engineering Consultants (CAPEC), in collaboration with the Institution of Technology of the UK (IET), supported by China Carbon Forum (CCF), jointly organized the “2011 International Forum on Plant Engineering Consulting & Low Carbon Industry Development” on Nov. 2, 2011 in Beijing 21st Century Hotel, Beijing, China. Mr. Dimitri de Boer, Team Leader EU Programs, with the Investment & Technology Promotion Office-China, spoke on behalf of CCF. CCF renewed its commitment to climate change action by supporting the event in liaising with senior speakers on low carbon economy for the forum. 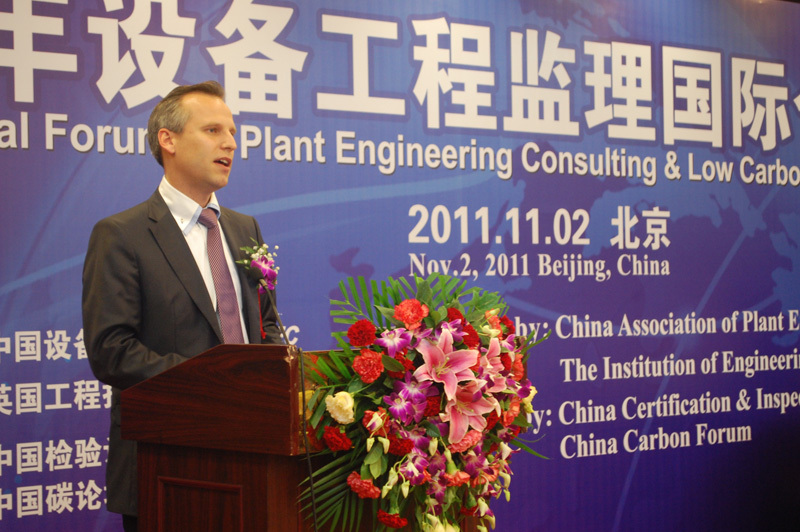 Dimitri de Boer presenting at the 2011 International Forum on Plant Engineering Consulting & Low Carbon Industry Development. Speakers at the opening session included Liu Pingjun, Deputy Administrator of AQSIQ, Edward Clarence-Smith of UNIDO, and others. The Forum aimed to enhance communication and cooperation between Chinese and international plant engineering consulting industries, build up partnership platform for industrial projects, and promote low carbon industry development. Participants included government officials, renowned domestic and international experts, industrial leaders, engineers and consultants. Topics discussed included opportunities and challenges in China’s 12th Five-year Plan, knowledge and information on low carbon technology, experience in delivering safe and quality projects, and responsibilities and roles of engineers in facilitating low carbon industry development. The main topics of the speakers included investment opportunities in China’s 12th Five-year Plan, techniques and approaches in delivering safe and quality projects, responsibilities of engineers to address environment issues, roles of plant engineering consultants in low-carbon industry chain, best practices in providing low carbon solutions, opportunities for new energy, renewable energy industry development, etc. 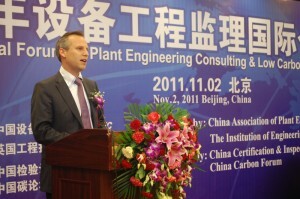 Mr. De Boer spoke in the morning session, presenting case studies of energy efficiency and industrial symbiosis in China. His presentation covered in detail the Tianjin Binhai New Area Industrial Symbiosis project. The audience was particularly interested in the concept of promoting industrial symbiosis in China. In an industrial symbiosis network such as the one promoted in the Tianjin project, the aim is to realize synergies between companies, such as where side products of one industrial process become the raw material for another. The forum was hosted by: China Association of Plant Engineering Consultants (CAPEC) and Institution of Engineering Technology (IET). The event was co-hosted by: China Carbon Forum (CCF), Association of Engineering Consultants Hong Kong (ACEHK), Kiev-Beijing Industrial Partnership Association (Kiev-Beijing), Global Energy Basel (GEB), China Academy for Building Research (CABR), China Academy of Social Science (CASS), and International Energy and Environment Protection Association (IEEPA).